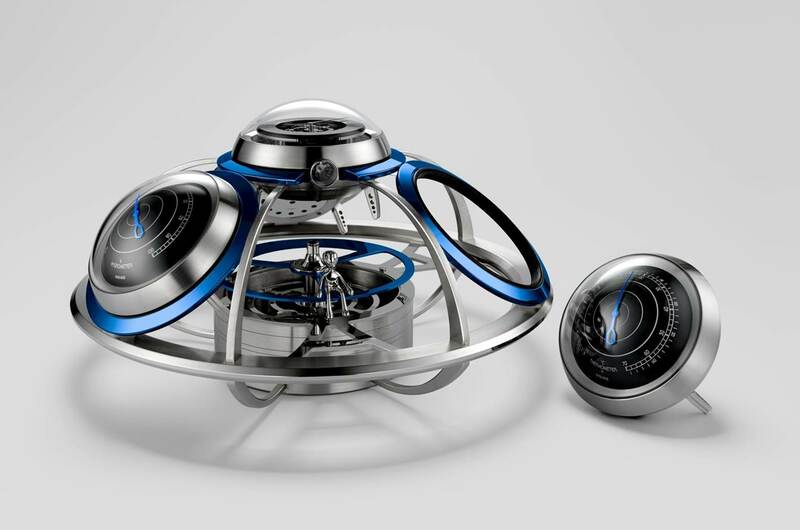 After its Legacy Machine collection’s newest intrigue, the Legacy Machine Split Escapement (LMSE) and 8-Day Octopod Clock, MB&F presents its latest intergalactic machine which is a take on the classic weather station: The Fifth Element. A combination of a mechanical clock, a thermometer, a barometer, and a hygrometer (all mechanical of course), this latest creation is once again a co-creation with L’Epée and is modelled after the quintessential 1950-60s UFO. One should never judge a book by its cover. Clock Element: Because weather forecasting is based on the speed of changes over time, the accurate time is required for meteorological observations. For the Fifth Element, L’Epée 1839 reengineered and skeletonised their 8-day clock movement to maximize transparency and visual access. Barometer Element: The barometer, which measures air pressure, is the mainstay of weather forecasting: as a general rule, increasing air pressure foretells good clear weather, decreasing air pressure portends inclement weather. The faster the change, the more extreme the coming weather. Hygrometer Element: The hygrometer measures the percentage of water vapour in the air; it displays this as a percentage of the maximum amount of moisture that might be held at a given temperature. Thermometer Element: Thermometers don’t simply measure temperature, but the average kinetic energy of a substance: the higher the temperature, the higher the energy. A thermometer is essentially a power reserve indication of the energy in the atmosphere around us. MB&F founder Maximilian Büsser had long looked for a beautiful vintage desktop weather station for himself, but could never find exactly what he was after; so with then intern-designer Stefano Panterotto he set about developing his own. The Fifth Element is a confluence of fantasies from classic UFO films, books, and comics of the 1950-60s. Without any delay, the team researched weather stations across the last 100 years as well as the concepts of transparency, biomorphism, and both “inclusion” and “swarm” in animal/insect worlds. While the Fifth Element was to be larger than its individual elements, each element had to be a strong standalone feature in itself: the team identified and came to understand each element, their stories, and how to feature them in a highly original way without concealing mechanical features. After defining the four elements, the next step was the design of the Fifth Element, the hub in which the pods are housed. The challenge was to create an archetypical UFO of the 1950-60s, but without concealing any of the four elements. Different structures and shapes were tried and tested, including a vertical configuration, before the final form was validated. Even then the process wasn’t finished as the first prototype looked a little too old-fashioned for MB&F, so it was tweaked yet again. And there’s one more function that MB&F surreptitiously integrates into all of its machines: the ability to make you smile. Once the design stage had been validated, the responsibility for making the Fifth Element a reality fell to L’Epée 1839. The pieces making up the complex framework of curves and circles composing the structure of the Fifth Element had to be milled from solid blocks of brass in a process taking many hours. Even with all of that metal removed to make a visually light and open frame, you can feel the inherent solidity and quality in the construction. Each of the four elements is composed of an outer case containing the core instrument of each module and can be placed on the Fifth Element structure. The clock had to be reengineered for a vertical escapement on the side for visual access. Thanks to integrated support the four elements are detachable, interchangeable and also stand on its own, returning to the mothership when required. In addition to the 8-day clock at the top of the Fifth Element, L’Epée created a second independent clockwork mechanism supported on bearings in the base and activated by a push button. This starts Ross the Alien pilot slowly rotating around the mothership as though constantly scanning the skies for both inclement weather and hostile invaders. The Fifth Element is available in 3 limited editions of 18 pieces each in Black, Silver and Blue. Discover and buy MB&F machines at The Hour Glass boutiques located in The Gardens Mall and Pavilion Kuala Lumpur. For more information on the Fifth Element, you can visit the website by clicking here.